From Wired.co.uk: The brain sees some faces as male when they appear in one part of a person's field of view and female when they appear in a different location, according to a discovery by neuroscientists at MIT and Harvard. These findings go against a long-held theory of neuroscience, specifically that how the brain sees an object should not depend on where that object is located relative to the observer, says postdoctoral associate at MIT's McGovern Institute for Brain Research Arash Afraz. Afraz and two researchers from Harvard -- Patrick Cavanagh and Maryam Vaziri Pashkam -- described their findings in the 24 November issue of Current Biology. The effect isn't noticeable in the real world because the brain draws upon other visual clues including clothing and hair style. 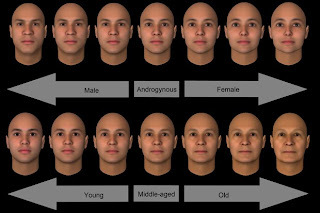 However, when people were shown computer-generated faces stripped of any other features that might identify gender, patterns of gender bias emerge.